We are happy to inform that our final year student Mr. JEROME AROCKIYA SEKAR A of CSE department placed in M/s Cognizant Technology Solutions held on 7th February 2019. M/s Sitel, Chennai is conducting off campus drive on 19th February 2019 for our Final year BE – CSE/ECE and B.Tech – IT students. M/s CSS Corp, Chennai is conducting off campus drive on 26th February 2019 for Final year BE – CSE/ECE and B.Tech – IT 2019 batch students. 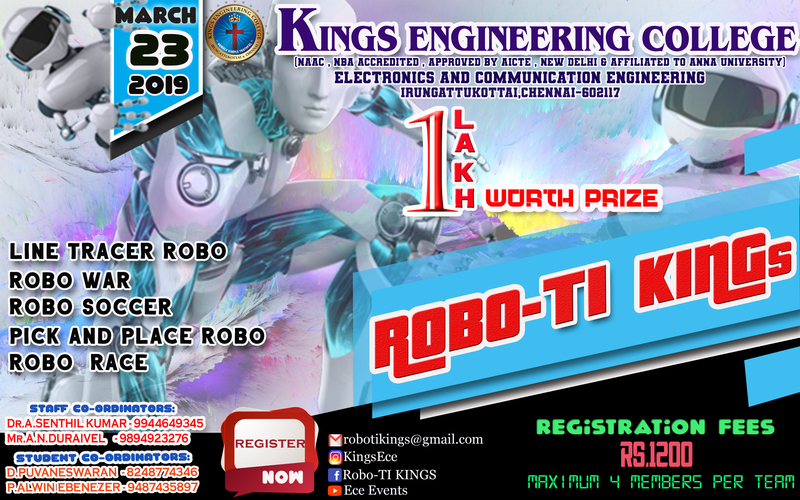 The Department Of Electronics And Communication Engineering is conducting a National Level Robotics competition “ROBO-TI KINGs” on March’23rd 2019 at our college premises.Click pdf for registration and more details. We are happy to inform that, Students of final year BE/B.Tech are instructed to apply online for the AU - CUIC - TNSLPP Drive - 2018-19 M/s Cognizant scheduled on 21-01-2019. We are happy to inform that, M/s Expanda Stand Private Limited is coming to our college for Campus Recruitment for our Final year B.E - Mechanical Engineering Students. College reopens for Second Semester on Friday 18th January for the First year students of all Departments. Christmas holidays starts from 22nd December 2018. College reopens on 3rd January 2019 for all the students. We are happy to inform that, our B.E - CSE & B.Tech - IT Students have been placed in M/s INFOSYS through Anna University Tamilnadu State level Placement Programme held during 06th & 08th December 2018. M/s Maintec Technologies Pvt Ltd Chennai is conducting campus interview on 12th of December (Wednesday) 2018 for Final years BE – CSE/ECE and B.Tech - IT. M/s HCL Technologies Ltd, Chennai is conducting campus interview on 11th of December (Tuesday) 2018 for Final years BE - Mechanical 2019 Batch. M/s Infant Engineers Pvt. Ltd, Chennai is conducting campus interview on 10 th of December (Monday) 2018 for Final years BE - Mechanical 2019 Batch. Christmas Celebration will be held on Friday, 21st December 2018, between 1.30 pm and 4.00 pm. Congratulations to Ms. JEYALAKSHMI T, B.E. Electronics and Communication Engineering for securing 44th Rank in the Anna University Examination during the academic year 2014-2018. “ONE DAY WORKSHOP ON ART OF WRITING FUNDING PROPOSALS & RESEARCH ARTICLES” conducted today in our college campus and our Principal felicitated the chief guest Dr. B. Chitti Babu Ph.D., SMIEEE. Classes will commence for IV Semester on 28th November 2018 and VI,VIII Semester on 3rd December 2018 for all the students of the academic year 2018-2019. Congratulations to Mr. Joshua Arputharaj J of III yr ECE, who has won the best business plan for profit startup event conducted by Entrepreneurship Development Cell (EDC) members at Kings Engineering College, Chennai and received a grant of Rs.1,00,000 from Mr.Satishmenon, CEO, Thirdware technologies Chennai. KINGS ENGINEERING COLLEGE is conducting a National Level GO-Kart Event " Kings Karting Championship". We are happy to share that Mr. Anand Kumar, Mr. Christanand and Mr. Ebenezer from BE–CSEand Mr. Nadar Joseph Jagan and Issac. T from BE - Mechcurrent Final Year 2019 are placed in BYJU’S, Think & Learn from Campus Interview. We are happy to inform Ms. Paul Selvi from BE – ECE and Mr. Ravi John Daniel from BE –CSE, current Final Year 2019 batch are placed in M/s Tata Consultancy Services from TCS National Qualifier Test. Our students of the current year have been meritoriously placed in prestigious companies which adds more glory to the institute. The Placement Cell of this college provides adequate support & guidance for the students in their perusal towards attaining their career goals & emphasis is given for soft skill development which complement’s the regular academic programmes. Special interactions in form of guest lectures, job oriented courses, special training programmes hands on practice sessions,direct Q&A are regularly organized with active participation from industry oriented professionals & experts to train the students to match the industry expectations. The Placement Cell of the Institute organizes campus placement initiatives of the graduating students of our college. The Cell provides complete support to the visiting companies at every stage of the placement process. The placement Cell has at its disposal ample equipments and infrastructure to cater to the various requirements of the visiting companies. At Kings Engineering College, we foster a condusive climate where industrial collaboration thrives along with research and development process, benefiting both.Here we encourage break through discoveries in Science and Technology, that can support continuous innovation and growth. Exclusive Students Portal has been developed with an intention to make learning easier for students.No need to go through all the books to cover the syllabus.Four years of study materials in one place! It has been a great experience to be a part of Kings Engineering College. I thank my professors for their constant encouragement and support.I am grateful for the efforts of Our Department of Mechanical Engineering to make us to attend the National Level Competition. Kings engineering college was the place where I have learnt the difference between studying & learning. We have not studied engineering. But we have learnt engineering. Studying engineering will make an top scoring student. But learning will make professionals. That helps me today to stay ahead of all other engineers in my company. All credits to my college & teaching staffs. I can positively say KEC has made me a better person. It has helped me develop a positive attitude towards my studies and discover more about myself. Professors are very caring and interested in students’ well-being. They make sure every class is fun, educational and interactive. Hi. Myself Alagappan Karthi.sp . Student of kings engineering 2009 - 2013 batch. I was unaware of the society, people and life statics during my school days. But my college enlightened me more on such things and now I am a successful entrepreneur.Thanks to my college and my professors who helped me for what I am today. It was a great time, spent in B.E MECHANICAL. KEC B. E/Mechanical department has very wonderful faculty and they are very cooperative. The relation between faculty and student is very cordial, which gave me an opportunity to excel further. The three years spent here was splendid and has helped me excel professionally as well as personally. Apart from academic, department offers various opportunity to enjoy our college days which was attracting by me towards college many of the time. International conference, project displays , workshops and training sessions etc., were helped me personally to groom myself in 360 degrees of life expectations. I express my heart full thanks to Dr.Mayakannan principal KEC, for giving me the opportunity's and Mr. Jeremiah HOD Dept. of mechanical for support and motivation. And all mechanical staff's who was my continues strength and keys in 2012 to 2015 .I can't forget to thanks Mr. Hanish Anand for support and encouragement to be a "Better Person". The constant support I got from all the staff at College helped me to succeed. All my teachers seemed to be very enthusiastic and experienced in their field and the academic coaching system made sure that outside of class time I got a lot of support for my overall progress, which I felt helped me a lot. This was particularly evident after getting placed. Kings college has always been a pioneer in mentoring all students irrespective of their talents. This college ensures students are nurtured spiritually, emotionally and mentally apart from academics. The morning assembly always rejenuates our minds with sound thoughts and staffs ensure they revise the previous day syllabus before the start of the day. The daily cycle tests, unit tests and model exams helps we are made ready to face the battle called exam without fear. We can feel free to reach out to our staffs for any assistance. Above all the values taught over here can never be forgotten. My four years at Kings engineering college have been excellent and a memory to cherish for a lifetime. The years spent here have been full of learning opportunities that were full of fun and frolic and sometimes with academic grind that one has to go through. The international exposure makes you a better man to face the challenges of the corporate world. When I first started kings engineering college I was unsure about my future and anxious about the different challenges I was heading forward to face. But all faculty gave me support and confidence to grow both personally and professionally. I was a dreamless student but after attending the classes of Mrs.Anitha Vijayalakshmi, Mrs.Mythili Thulasingam and Mrs.Uthira Ramya Bala I started admiring the way of teaching in simple and effective manner and aspire to become a professor. The same fire zealed me and finally I am a successful professor. I was an average student but a best teacher right now in a reputed engineering college. I gave 100% results in DSP and CS for 3 consecutive years. It's all through foundation given by our faculty of kings. Field of teaching is less paid job but satisfactory and worth of happiness in the development of students welfare ones again thanks for the management and faculty who made me cherish the memories I made in all. I can affirmingly say that kings engineering college has presented me to the world as a confident better person in all perspective of life as career. The thing that I admire the most is the support that I received from everyone around. The facilities were impeccable and the staffs were outright and friendly at the same time. The supportive environment and the confidence boosted here have helped me achieve and has made me stand my grounds. Kings © 2019. All Rights Reserved.